My Patreon campaign has been established to support my dream of being a full time cartoonist. Syndication is not an option these days as the number of newspapers shrink and comic sections vanish. I am running in 5 weekly newspapers. I act as my own syndicate, emailing and calling newspapers one evening every other month. In 2019, I will be working one evening each week, contacting newspapers across the U.S. 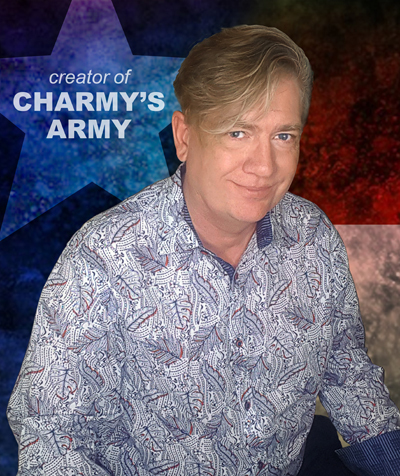 In order for me to monetize my cartooning dream so I can continue doing what I so passionately love, drawing my comic strip Charmy's Army. I need you support. Funding is crucial because marketing my work at comic cons and growing my fan base is expensive. Rarely do I make any profit at these shows. More often than naught, I lose a few hundred bucks per show. These shows are investments. I add a few dozen fans at every show. Your support will help me spread the word about my comic strip and with that, you will help me realize my dream and expand my work into newspapers across this amazing country... and in return I will reward you will a ton of EXCLUSIVE MATERIAL. including FREE digital posters and all sorts of awesome ORIGINAL artwork! WHEN WILL I SEE UPDATES? I will post something weekly. My comic strip will appear once each week. If you are supporting me with at least $1 monthly, you will see the strips a few days earlier. I will post exclusive sketches and first looks at my storyboards and my strips in progress. Cartooning is what God put me here on Earth to do and I am going to work hard to achieve my destiny. I publish more material than the other cartoonists here on Patreon! * FREE ART! Yes, over a set period of time, you will earn free drawings. NO - Pay in any currency! As this is US based website, everything is written in Dollars, but you can use any currency and it will be automatically converted. And PAYPAL is now accepted! Yes, please only sign up to donate what you can easily afford. Even $1 per month will make a huge difference and would be greatly appreciated. My costs to produce this strip run me well over $100 per month with website fees, art supplies and production costs. Each Comic Convention costs me around $800 and that is without airfare included. I am only doing local shows in Houston this year. Next year, I would love to do shows in four different states... or more! Those shows will each run close to two grand each!!!!! So, I appreciate every cent I can get. CAN I STOP DONATING, INCREASE, OR DECREASE MY DONATION? Yes of course! If you can't afford to donate in the future, or you want to move up or down to a higher or lower support tier, that's absolutely fine. You can just log in to change or cancel the account whenever you want. STRIPS POSTED EARLY - Patrons will see weekly strips a few days before they are released to the public. As I work on my strip, you will see a few behind the scenes shots of my work in progress. Your pledge will help me finally realize my dream! BRAGGING RIGHTS - You will also receive my gracious gratitude. Who knows, maybe one day you can say, "I knew Davy Jones when he was just a dreamer wanting to draw the next big comic strip"! EXTREMELY EARLY PREVIEWS - See all of the comic strips from the next month as soon as they are prepared. You will see my strips an entire month early AND see them all at one time! FREE SNEAK PEEKS - See even more of my work in progress!!! You will feel like you are in the studio with me! Sneak peek at my storyboards! See how I write my award winning comic strip! GET A FREE PIN BACK BUTTON EVERY MONTH!!! To be mailed every 6 months. If I can get support and reach $15 bucks per month, I'll start dropping a jpg of a sketch every day here for anyone supporting be with $3 or more each month. These sketches will provide an inside look at how I create my strips.